You’re bound to enjoy the gardens, but there are many other features in this estate to make you feel at home. The high vaulted ceilings and tile floors keep the rooms cool throughout the day. The house is a natural gathering place for parties, events, or family reunions because the living spaces are arranged to encourage mingling but also offer many furniture groupings appropriate for intimate conversations. One recent guest noted, “…it was one of the most remarkable places I’ve ever been. I would highly recommend it!” Usher out the day with a glass of wine on the patio or pool deck, it’s an experience you won’t soon forget. The moment you drive onto the grounds of Canefield House villa, you’ll be enchanted by its gardens set on 10 acres, encompassing a private setting. This home was built where sugar cane was once grown during plantation days. Gardens were planted which today showcase the three pavilions comprising Canefield House. 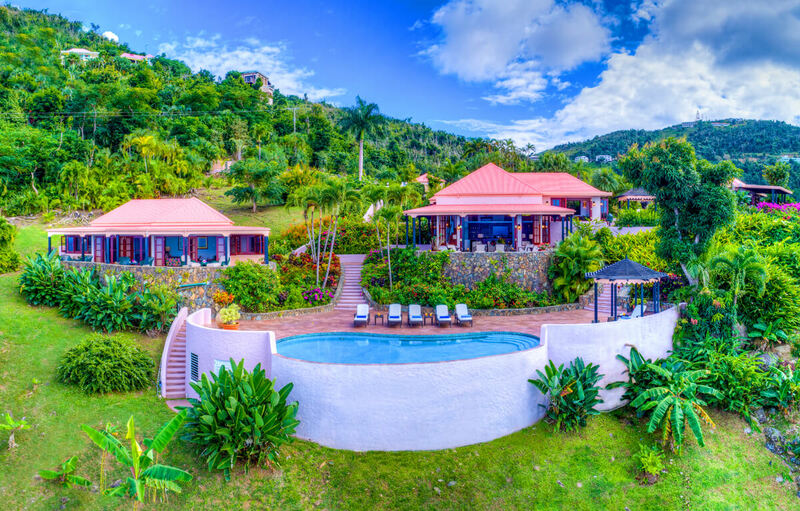 Tiered across a hilltop overlooking Brewers Bay and the Atlantic, Canefield House offers three air-conditioned bedroom/bath suites and a choice of several outdoor living spaces. A broad staircase descends through gardens from the parking area to Canefield’s main pavilion. The two-storied main pavilion is the gathering spot for everyone, offering on its main level a gourmet kitchen, powder room, a formal dining area for eight surrounded by French doors which open out to a second alfresco dining patio under a garden gazebo. An arched, main-level gallery overlooks the main pavilion’s lower level, the Great Room, which is outfitted with satellite TV, music, books, a wet bar with mini-fridge, and furnishings for reading, conversation, and cocktails. Tall French doors open to a semi-circular terrace above the pool, yet another spot from which to savor the sounds of a fountain, tropical bird songs and cool trade winds blowing through the trees; flowering yellow Allamanda winds around the terrace’s stone benches and borders sea views below. A curved staircase leads you down a few steps to Canefield’s pool (which can be heated by advance request) and stone-tiled sun deck. This area is bordered by plantings of bougainvillea, Allamanda, heliconia and hoya, and adjacent is a gazebo, canopied by a mango tree and hung with purple thunbergia. Below the pool area is a green lawn planted with bananas and other fruit trees, breadfruit, palms and other tropical flora. Situated on the far side of the main pavilion is the master pavilion, housing the large air-conditioned king master bedroom with a sitting area, an office nook, a bath with a walk-in closet, dressing area and a stone-and-tile shower. French doors open to a private covered terrace overlooking green hills, and hung with a hammock, just right for a quiet afternoon snooze. On the opposite side of the main pavilion is a walkway threaded through gardens to the air-conditioned guest bedroom pavilion, offering the Blue Suite and the Green Suite. The Blue Suite can be made up as a king bedroom, or with two twins (with your advance request). It features satellite TV, an alcove with two built-in single daybeds, ideal for a small child or two who must be near their parents or nanny. A walk-in closet and tiled bath with hand-painted sinks and mirrors are en-suite. French doors opens out to a covered terrace of native stone, furnished with table and chairs. This terrace is shared by the adjacent Green Suite, the third air-conditioned bedroom, a queen. This suite also has a single built-in daybed in an open nook, a double-vanity bath, and access to the covered terrace just outside. Each bedroom/bath suite has its own private entry. Depending on the season, guests might be treated to fruit grown right on the estate, such as guava, coconut, avocado, banana, sour sop, breadfruit, mango, red and white grapefruit, papaya, key limes and lemons. Ask the housekeeper or Oliver, the estate’s longtime gardener, what might be ripe for picking. Canefield House offers privacy enclosed within a setting of natural beauty; it’s the outdoor-living experience here which makes this estate so memorable. At an elevation of 1,500 feet above the sea, it’s cooled by almost-constant hillside trade winds, and its high location provides views for miles into the distance, with Brewers Bay set below. You can drive down to the beach in a few minutes, or remain sequestered and relax within the grounds of Canefield House, enjoying the varieties of flowers, island plants, and mature trees. The atmosphere of this very place and its spaces allow everyone to have private time to themselves or with loved ones. Canefield House is a unique offering for families and friends seeking an intimate experience within a private garden setting, close to nature.